I’m today’s guest blogger on Wattpad! This is a man used to dealing with obsession. Quick…what do James Bond, Lord of the Rings, and Game of Thrones have in common? I’ll tell you on Wattpad Insider…I’m today’s featured guest blogger! In “Obsession With Evil,” I take a quick look at the fuel that drives the best bad guys we’ve got in books and movies. Swing by and give me and Wattpad your two cents! 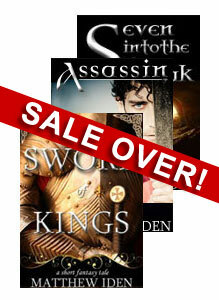 This is a breakdown of a recent KDP Select experiment (a six-day sale 6/22-6/26) I ran on three short fantasy titles of mine—Sword of Kings, Assassin, and Seven Into the Bleak—to see if visibility for one would mean sustained visibility for all. Read Part I here.